Espen Olsen’s job is a little different from that of most police officers. 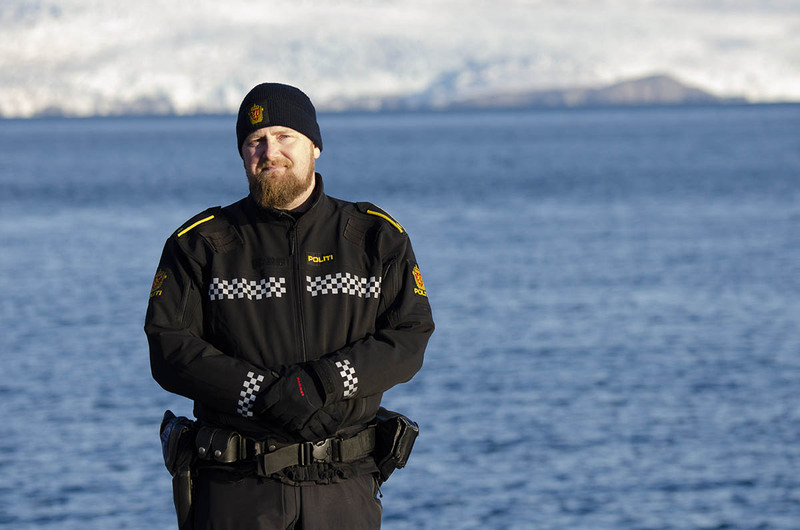 He’s the police chief inspector for the Governor of Svalbard’s office and is in charge of its new drone program. He has begun using small drones in this Norwegian archipelago, situated roughly halfway between mainland Norway and the North Pole. Drones have been used in the Arctic for several years, including Aeryon Scouts, Insitu ScanEagles and AeroVironment Pumas, which have aided in studying sea ice, monitoring wildlife and keeping an eye on climate change. Olsen probably has the most unique uses for his collection of DJI drones, however, which includes an older Phantom 3, two Mavic Pros and a Matrice. For example, one day last summer while he was the officer on duty he was called to investigate the shooting of a polar bear. He rode more than an hour and a half on a Medevac helicopter to the remote location, where a guard on a tourist expedition had been attacked by a bear, which had been killed. The guard turned out to be OK but was flown away. When the helicopter returned, it included two of Olsen’s colleagues, who had thought to bring one of the drones. There was a strong wind that day, and no GPS, but he risked the flight anyway to get some orthorectified photos of the area. “What I did was a conscious decision because the photos were so important, I was willing to risk the drone,” he said during an interview at the first Nordic Drone Event, held in Svalbard in September and hosted by UAS Norway. By the official government count, there are more polar bears than people in Svalbard (3,000 vs. 2,667), although they usually manage to stay well apart. When they don’t, trouble can happen. Polar bears are a protected species, so they can’t be shot unless they pose a genuine threat. The man who was attacked was the one who was supposed to guard against that threat. Had he been negligent? “it’s a big issue here, and they stir up a lot of feelings,” Olsen said of the bears. Not all of Olsen’s work is so potentially violent. Much of it, at least the work involving drones, includes mapping and studying cultural sites, as well as monitoring erosion. During his presentation, he showed a photo of a grave from the 1600s or 1700s that was threatening to dump its inhabiting skeleton, the remains of a Russian trapper, into the sea. He had experimented with consumer drones as a police officer on the mainland, “but police in Norway work very slowly, it takes a long time,” he says. When he started working in Svalbard for the Governor of Svalbard’s office less than two years ago, he brought that interest with him and found more fertile soil for drone use. He enjoys working with other departments on issues like antiquities mapping, something he wouldn’t be doing on the mainland. He’s also looking forward to establishing protocols for using drones and moving to more complex operations with them. Holding an environmental-themed conference in the Arctic makes sense, according to the organizers. The Arctic is cold, it’s remote, it’s sparsely populated with little infrastructure — yet all this is changing, and fast. “The Arctic is warming at twice the speed of the rest of the world, providing access to untapped natural resources along with new navigation routes across a 1.1 million square mile expanse of ocean that is increasingly open for longer periods, as more ice melts each year,” says a new study from Georgetown University’s Institute for the Study of Diplomacy, which is grappling with the geopolitical realities of a warming Arctic region. It notes that “what happens in the Arctic does not stay in the Arctic,” as the water that flooded homes in Houston in 2017 began as melting glaciers and rising temperatures in the north alter jet stream patterns, leading to more severe droughts in the U.S. and Canada, polar vortexes in the winter on the U.S. East Coast, and more frequent and powerful tropical hurricanes. It is, in other words, as good a place as any to consider the ways that unmanned systems can help understand the environment. Rune Storvald, a senior scientist at the Earth Observation Department of the Northern Research Institute, or NORUT, based in Tromso, Norway, also heads up that organization’s Unmanned Aircraft Group. Speaking later to Unmanned Systems, Storvald said NORUT had assessed drone uses in the Arctic a few years ago and found a few compelling use cases: atmospheric research, monitoring the size and movement of glaciers, measuring sea ice and studying wildlife. Using drones for atmospheric science — a big thing in a warming region — means “you could measure aerosol profiles and concentrations, you could look at black carbon transport into the Arctic and deposition processes, which is not very well represented yet in climate models, so you need better understanding,” he says. As for measuring sea ice, “you could measure that with a drone fairly easily with a ground penetrating radar,” he says. Using drones could make these tasks easier, as researchers wouldn’t have to climb on glaciers with GPS units to make measurements, for instance, or venture too close to wildlife to study them. In 2019, NORUT may participate in an oil spill exercise, study power line surveillance and inspection, and even help reindeer herders in Norway’s far north keep track of their charges, lessening the need for four-wheel drive vehicles and snowmobiles. Of course, there are challenges involved with working in the Arctic. Even in the height of summer, getting dressed involves putting on a pair of long underwear, preferably wool. And Svalbard is large, almost as big as the rest of Norway, but with far, far fewer people. Communications, as both Storvald and Olsen mentioned, is also a big problem in a large region with little infrastructure (one of Svalbard’s main tourist attractions is Pyramiden, a former Russian mining town abandoned in 1998). Cell towers are far from common and satellite connectivity can be spotty. Telenor, a multinational telecommunications company based in Norway, has been working with drones as a way to set up ad-hoc networks. Last summer, they launched a program along with Andoya Space Center and fixed-wing drone maker Robot Aviation to launch drones to create 4G networks in areas that don’t have connectivity. According to the Andoya Space Center, this could be critical as commercial shipping, tourism and even cruise ship visits are increasing in the Arctic. What if a cruise ship ran into trouble in an area with no communications? Olsen says he took part in one such demonstration last May, when the Governor of Svalbard, Telenor and others used a Kongsberg Maritime Broadband Radio (MBR) to set up a communications relay for a mock rescue. Next summer, the governor’s office, Telenor and other partners will again work with the MBR to set up a mesh network in the Arctic. Olsen says they intend to establish communication in a remote region using a fixed-wing drone as the main backbone link to existing communications infrastructure. “This could prove vital in a situation when normal communication is not working, or as in our case, a daily part of operating in the Arctic,” he writes in a follow-up email. Environmental activist Penelope Lea has a sizable resume in environmental protection, as the leader of the Eco-Agents, an environmental organization for children. At 14, she was the youngest attendee at the Nordic Drone Event, but she prompted immediate action with her call for greater action on climate change, particularly on cleaning up plastic garbage in the ocean and on beaches. UAS Norway’s Anders Martinsen, the organizer of the drone event, decided that something could be done. In short order, he rallied several companies — including Elefun, Avnior, the Norwegian Coastal Administration, Teknova, Maritime Robotics and FLIR — provide Lea and her groups access to drones, underwater robots, training and data analysis help, so they could tackle ever-growing plastic pollution. In a follow-up email, he writes that Telenor has signed up to provide connectivity, lab resources and artificial intelligence software to help parse data from the drones and target their operations. An annual program to use unmanned systems to fight trash is expected to launch this year.